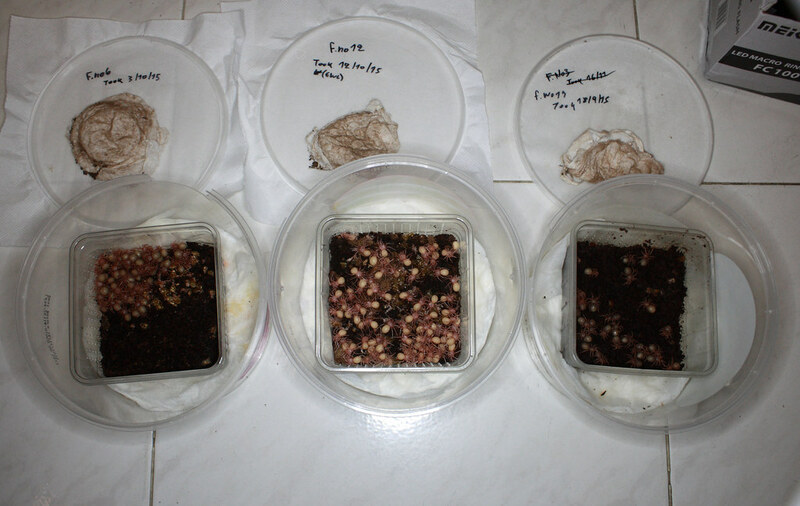 2015 started good.I allready have 6 mature males.3 of them are from my own breeding,late 2011 and one wc ’14.All 3 cb males had their ultimate molt when they reached 10th molt. In the next couple months 4-5 more males should be mature too. 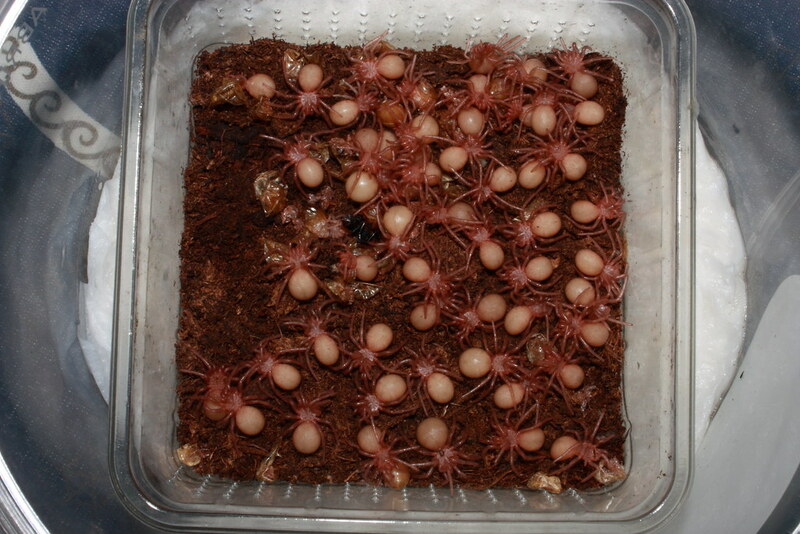 About 15 wc females are fresh molted and ready to breed and in the next 5-6 months 11 cb’11 Females should also be ready to breed,plus some more wc’s. Female no16: 8/3/15 Mated-M.no1 2x inserts. 20/5/15 Mated-M.no4 1x insert. 27/8/15 Mated-M.no7 1x insert. Female no17: 25/2/15 Mated-M.no1 1x insert ? 20/5/15 Mated-M.no1 2x inserts. 2/8/15 Mated-M.no5 1x insert. 23/10/15 Made egg sack infertile. Female no19: 8/3/15 Mated-M.no2 1x insert ? 7/5/15 Mated-M.no1 1x insert. 2/8/15 Mated-M.no7 1x insert. 26/8/15 made an egg sack! Fertile. Female no14: 25/3/15 Mated-M.no1 2x inserts. 20/5/15 Mated-M.no6 1x insert. 18/7/15 mated-M.no7 1x insert. 13/10/15 Made egg sack Fertile. Female no1: 25/3/15 Mated-M.no2 1x insert. 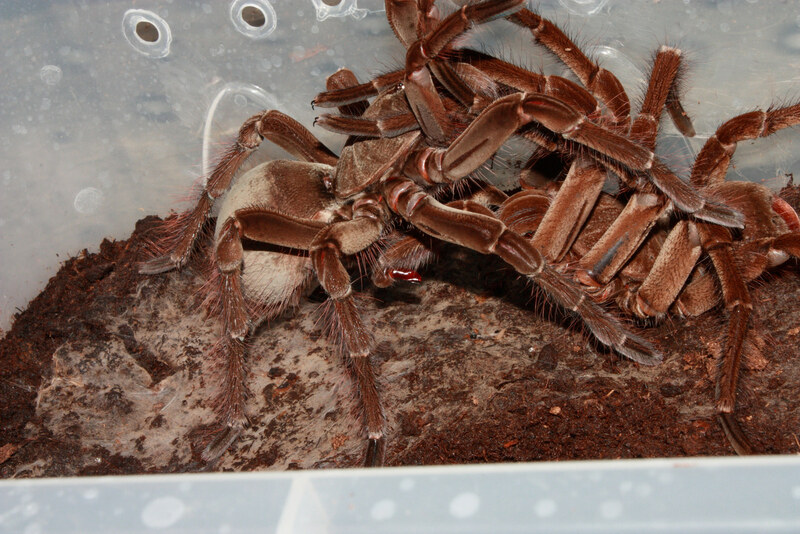 1/11/15 Molted. 21/11/15 Mated M.no3 1x insert. 14/12/15 Mated-M.no3 1x insert? 16/1/16 Mated-M.no7 1x insert. 15/6/16 made egg sack. Fertile. Female no2: 20/4/15 Mated-M.no4 1x insert. 20/5/15 Mated-M.no5 2x inserts. 14/6/15 Mated-M.no7 2x inserts. 18/7/15 Mated-M.no5 1x insert. 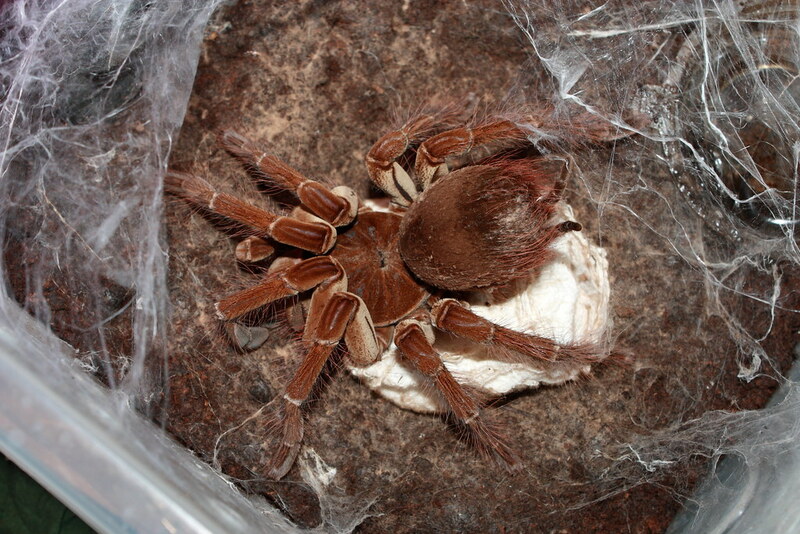 12/15 Molted. 10/1/16 Mated-M.no7 1x insert. Female no12: 20/4/15 Mated-M.no5 1x insert 14/6/15 Mated M.no5 2x inserts 11/8/15 Mated-M.no8 1x insert. 17/9/15 Found egg sack Fertile. Female no7: 20/4/15 Mated-M.no3 1x insert. 20/5/15 Mated-M.no7 2x inserts 11/8/15 Mated-M.no5 1x insert. 20/10/15 Found egg sack Fertile. Female no4: 7/4/15 Mated-M.no4 1x insert. 14/6/15 Mated M.no4 1x insert 11/8/15 Mated-M.no6 1x insert. 23/8/15 Found an egg sack. Fertile. Female no5: 7/5.15 Mated-M.no5 1x insert. 14/6/15 Mated-M.no8 1x insert 27/8/15 Mated-M.no8 1x insert. 4/11/15 made an egg sack. infertile. Female no8: 7/6/15 Mated-M.no4 1x insert 2/8/15 Mated-M.no6 1x insert 11/8/15 Mated-M.no4 1x insert. Female no9: 7/6/15 Mated-M.no8 1x insert. 14/6/15 Mated M.no6 1x insert. 28/9/15 Mated-M.no8 1x insert. 3/12/15 Mated-M.no7 1x insert. Female no6: 7/6/15 Mated-M.no9 1x insert. 2/8/15 Mated-M.no8 1x insert. 5/9/15 Found an egg sack! Fertile. Female no20: 18/7/15 Mated-M.no3 1x insert. 11/8/15 Mated-M.no1 1x insert ? 3/12/15 Mated-M.no8 1x insert. Female no3: 18/7/15 Mated-M.no4 1x insert. 27/8/15 Mated-M.no9 1x insert. 28/9/15 Mated-M.no6 1x insert ? Female no15: 24/11/15 Mated-M.no7 1x insert? Molted 11/15. 10/1/16 Mated-M.no8 1x? 26/6/16 Found an egg sack. Female (CB1): 24/11/15 Mated-M.no6 1x insert.